You will not find this style of non slip sock on another website. These are exclusive to our company. Our dark grey ankle height non slip socks will fit a 7" to 9" foot. They are made of 80% cotton, 15% spandex, and 5% elastic. 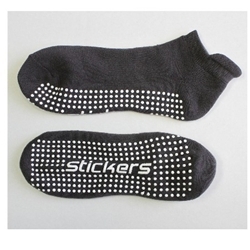 They also feature white non slip dots on the bottom of the sock. This sock features terry cloth throughout the bottom of the sock.